Well, enter Curdie, bringing utter relief simply by being a character who actually does something. Then the story picked up the pace, and I started tolerating it, and then I began to like it. This was one of those rare tales where I loved the plot far more than the characters. It was just so wackily creative and yet took itself so seriously. I loved the world of the goblins and how they have their own animals, like the cat with legs as tall as a horse's. The moment the sun sets, all the people rush into their homes, slamming the windows and locking the doors. Even the animals of the human world come inside, too. The goblins and their creatures rule the world at night. There are two separate worlds--night and day--and the inhabitants of this world never cross paths...until Curdie and Irene knock a few things upside down. I liked this book. I really, really liked it. I loved the grandmother, and her magic, and her attic room with the weird bathtub. The magic was lovely. Almost everything in this book is lovely. Sometimes you just want to read about nice things. There's the grandmother, and the glowing lamp that guides people on the path they should take, but some people can't see it, because the grandmother chooses not to reveal it to them yet, and....yeah. You're already seeing what it took me 200 pages to figure out. It's an allegory. The entire book is allegorical. And it took my idiot self almost the entire book to figure that out. Hey, I didn't know George MacDonald was a minister, okay? Anyway. I liked this book. I liked it even before I knew the full depth of what it is. I'd been in a reading rut, and this book filled me up like a book had not in a long time. And then.....the book ends on a total cliffhanger. Seriously. I cannot tell you how the story ends because there is no end. It's chopped off right at the climax. I did not sign up for this deceivary. 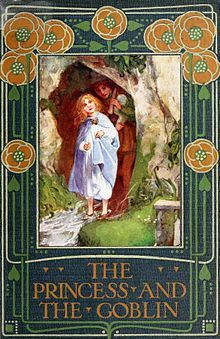 I liked the book, but there are just far too many others things I want to read for me to rush out and find the sequel to The Princess and the Goblin. But oh well. I would give my kids this book, and they would probably love it. And that's the whole point, right? Ver here. I mean it when I say you have a gift for this. If you wrote a review promoting a phone book, I would probably read it. Thanks for adding yet another book to the list I absolutely have to read!